“Thank you for being my son”…is a statement that is used daily in our household, as a good-night or good-bye. It is a family tradition and it is usually answered with, “Thank you for being my mom” or dad or brother et cetera. In the wee hours of this morning, I said that to my teenage son as I saw him off to his first solo international adventure – a mission trip to the Dominican Republic with our church. Of course, I was wimpy, I was – hmm, weepy (didn’t let him see that though). I worry. That is my job. I am the fortunate mother of sons. My guys are pretty good kids. They give me joy and make me laugh… a lot. With the heart of the young, they both have a true joie la vivre; which is so refreshing in this “24-hour bad news” society. In fact, just yesterday, I was attempting to speed-shop through Target for last minute trip items with them. I was so intent on getting my “to do’s” done that I almost missed the real important thing – moments of fun with my boys. It was like an auld lang syne moment, as my older son climbed into the red plastic basket and the younger one pushed him around the toy aisle. 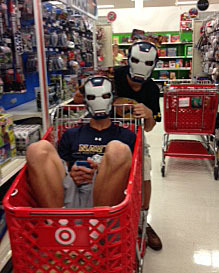 Never mind that they are both in high school now, those super-hero toys are so much “cooler” than when they were little! I mean, have you seen the new Iron Man mask? Of course, they argued over who would “drive” the cart, as they raced through the aisles. I totally expected the “shopping police” to come and get us… fortunately; we eluded them and instead were treated to other shoppers giggling right along with us. We were all silliness. It was a blast. What a blessing for me – for that moment, I forgot I had to be an adult and just let it go. Thanks guys. Sometimes, in the day-to-day grind, we forget how to just let the fun and joy of the moment take over. My frolicking kids reminded me of this. I am also reminded that it is that same joy that God wants for us too. Why are we sometimes so stoic when it comes to our lives…and our faith? Jesus tells us in scripture… I have come so that they may have life and have it more abundantly. (John 10:10). Think about it. Abundant life. Abundant Joy. Even Jesus’ first public miracle at the wedding in Cana happened at a party He and his friends were attending. Life is temporal. We need to get it right the first time, because this is the main event, this side of eternity. Our lives are like wisps of vapor, (James 4:14) therefore we should live with an eternal mind set and use the time we have here to be joyful and like my giggling kids, bring joy to others… I am not so Pollyannaish that I don’t realize that we won’t or don’t experience pain in life – we do and we will, Jesus told us that himself, “You will have tribulations, but be of good cheer, for I have overcome the world.” And he said that just hours before He went to the cross. John 15:11 11 I have told you this so that my joy may be in you and that your joy may be complete. Joy – not a feeling but a fact. The very meaning of the word Gospel is Good News. Jesus came to give us the Best of News. That to trust in Him, to confess with our mouth and believe with our hearts that we will be saved (e.g. have everlasting life in Him and with Him). Now THAT fact is something to have real joy about. Well, even if you have to muscle through it at first, a pastor friend told me once, “If you have trouble finding joy, begin to praise God, and you will find it in the middle of praising Him”. So today I invite you to remember joy…no matter what the present circumstances are. Let us start each day practicing the joy that even the very act of awakening can be. Take time to thank God for it, and remember, “This is the day that the Lord has made; let us rejoice and be glad in it” Psalm 118:24.